Casa do Pinheiro is a beautiful, modern, newly decorated, three bedroom, two bathroom detached villa with private swimming pool and landscaped gardens with views to the sea. Fully equipped kitchen and large well-furnished and equipped lounge with open fireplace. Minutes away from the fantastic, uncrowded beaches of Arrifana, Monte Clérigo and Amoreira which offer swimming, surfing, fishing and sunbathing. A haven away from the crowds making it an ideal place to relax while being just a short drive from the town of Aljezur and its restaurants. Even closer to home there are restaurants in Vale da Telha and nearby Arrifana and Monte Clérigo. The property is most suited for up to six people. No dogs, cats or other pets are allowed in the villa. The villa benefits from a modern smart Internet-connected TV giving access to the Internet and services that you subscribe to such as Netflix and Amazon Prime Video. A child's high chair and/or cot are available on request for an extra charge. English satellite TV, which also provides radio, and Portuguese TV are provided. The smart TV also gives access to the Internet and many other applications. Free Wi-Fi Internet access is provided. Beach towels are not provided. A property manager will be available at all times should you encounter any problems during your stay. The villa appears to have been redecorated recently as it looked really fresh and it made a fantastic base for our exploration of the western Algarve. The scenery is amazing and the local (quiet) beaches are even better with long stretches of sand each with nice beach-side restaurants. There are good, friendly restaurants within walking distance of the villa and others in Aljezur and beyond. We will definitely return. It was nice to welcome a member of the clan to our villa and we look forward to your return. The Villa is in a quiet place, away from the busy southern Algarve. Local beaches are fantastic, and great for surfing/messing in the waves, with beautiful golden sand. The villa was very clean, with all the necessary pots, pans and home from home necessities. The pool was good, and cleaned while we were there. The villa is very well thought out, beds are great and bathrooms very nice with good showers! Locally there are some good restaurants; Joses in particular whilst looking like a football bar has some really good food (wild prawns highly recommended). For a more upmarket experience O Paulo in Arrifana is very good, with fantastic service and great views. Walking to the beach at Monte Clerigo is possible, but young ones might struggle. However the clifftop walks in the vicinity are easily reached from the villa and offer great views, the chance to see wildlife and experience lovely sunsets and starscapes. Highly recommended! Thank you. We look forward to welcoming you back to Casa do Pinheiro in the future. 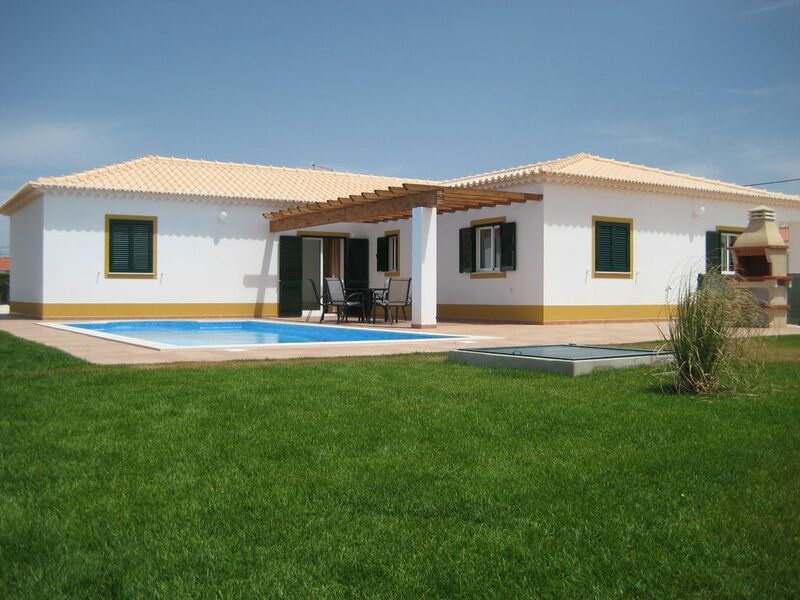 Spacious and airy villa close to glorious beaches of the western Algarve. Great property - excellent condition, well furnished, well decorated, well equipped and clean/well maintained. Listing described the property really well. We were very well looked after by Paul (local agent). We visited Aljezur, Arrifana, Lagos, Monte Clerigo and Sagres amongst other places. Local beaches were great and the cliffs, just a 15 minute walk from the house, were really dramatic. Good local restaurants. Would happily recommend. We felt very comfortable during our stay. The house is beautiful, clean, neat, adequately equipped and lovely furnished. The pool is great, and after long trips in the evening it was relaxing. Gill and Paul (the site managers) provided a good service, were always available and very helpful in awkward situations. We loved the family friendly beaches Odeceixe, Amoreira, Monte Clérigo and Arrifana. The restaurants around are all recommended, because the food there is delicious and fresh. We were never disappointed. The church, the market and the castle of Aljezur are worth for a visit. We'll be back! Set in the midst of a national park, the villa is located at the end of an easy drive from Faro airport or Lisbon when the flight prices are cheaper! Also, just 30 minutes away is the beautiful town of Lagos with its fantastic marina surrounded by restaurants, shops and bars with street entertainment throughout the summer in the old town centre. The villa is within easy reach of five golf courses or, if you prefer, shopping in the retail parks of Portimao. If you're feeling more energetic, the water parks around Albufeira are great fun! For motorsport fans, the villa is conveniently located approximately 30 minutes away from the new Algarve Motor Park (Autódromo Internacional do Algarve). A full programme of events is available from the circuit's web site. For bank transfer payments, a 20% deposit is required to secure a booking. The balance is payable six weeks before the rental commences. Payment can be made in euros or British pounds. Online payments through HomeAway are payable in full, in euros, at the time of booking. An additional charge will be levied for the use of gas central heating, if needed, which can be paid locally.